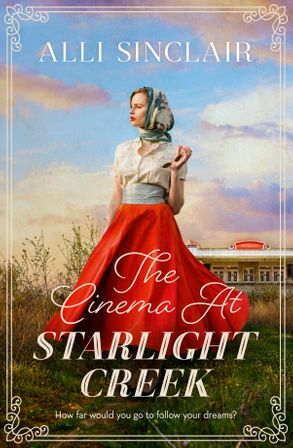 Queensland, 1994: When location manager Claire Montgomery arrives in rural Queensland to work on a TV mini-series, she's captivated by the beauty of Starlight Creek and the surrounding sugarcane fields. Working in a male-dominated industry is challenging, but Claire has never let that stop her pursuing her dreams-until now. She must gain permission to film at Australia's most historically significant art deco cinema, located at Starlight Creek. But there is trouble ahead. The community is fractured and the cinema's reclusive owner, Hattie Fitzpatrick, and her enigmatic great nephew, Luke Jackson, stand in her way, putting Claire's career-launching project-and her heart-at risk. Hollywood, 1950: Lena Lee has struggled to find the break that will catapult her into a star with influence. She longs for roles about strong, independent women but with Hollywood engulfed in politics and a censorship battle, Lena's timing is wrong. Forced to keep her love affair with actor Reeves Garrity a secret, Lena puts her career on the line to fight for equality for women in an industry ruled by men. Her generous and caring nature steers her onto a treacherous path, leaving Lena questioning what she is willing to endure to get what she desires. Can two women-decades apart-uncover lies and secrets to live the life they've dared to dream? Alli Sinclair, an adventurer at heart, has won multiple awards for her writing. She is Australian and has lived in Argentina, Peru and Canada, and has climbed some of the world's highest mountains, worked as a tour guide in South and Central America and has travelled the globe. She enjoys immersing herself in exotic destinations, cultures and languages but Australia has always been close to Alli's heart. Alli hosts retreats for writers and presents writing workshops around Australia, as well as working in film on international projects. She's a volunteer role model with Books in Homes and is an ambassador for the Fiji Book Drive. Alli's books explore history, culture, love and grief, and relationships between family, friends and lovers. She captures the romance and thrill of discovering old and new worlds, and loves taking readers on a journey of discovery. Alli's website is. www.allisinclair.com.